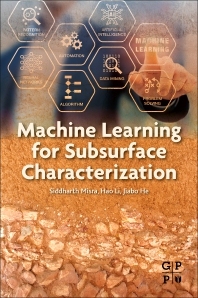 Machine Learning for Subsurface Characterization focuses on the development and application of neural networks, deep learning, unsupervised learning, reinforcement learning, and clustering methods for subsurface characterization under constraints due to financial, operational, regulatory, risk, technological and environmental challenges. The book introduces readers to methods of generating subsurface signals and analyzing the complex relationships within various subsurface signals using machine learning. Algorithmic procedures in MATLAB, R, PYTHON, and TENSORFLOW are displayed in text and through online instructional videos to assist training and learning. Field cases are also presented to demonstrate real-world applications, with a particular focus on examples involving shale reservoirs. Explaining the concept of machine learning, advantages to the industry, and applications applied to complex subsurface rocks, this book delivers a missing piece for the reservoir engineer’s toolbox. Siddharth Misra is currently Assistant Professor at the University of Oklahoma, researching data-driven predictive models, machine learning geosensors, and front-tracking methods in pressure/rate transient analysis. He previously worked for Schlumberger, Anadarko, Marathon, RWE Dea AG, and Halliburton in various research capacities. He owns at least 5 patents, is Associate Editor on SPE Reservoir Engineering and Evaluation journal, and works on several association committees. He earned a PhD in petroleum engineering from the University of Texas and a bachelor of technology in electrical engineering from the Indian Institute of Technology in Bombay. Hao Li is currently a Graduate Researcher Assistant in petroleum engineering at the University of Oklahoma researching in machine learning in well logging and pressure rate transient analysis and modelling. He earned a MS and BS in petroleum engineering, both from the China University of Petroleum in Beijing. He has published in numerous publications and received the honor of “Beijing Outstanding Graduate” in 2013. Jiabo He is currently a Graduate Researcher Assistant in petroleum engineering at the University of Oklahoma researching shallow learning methods for sonic log generation, applying machine learning models to deploy wells drilled within the reservoir. He earned a Sooner Heritage Scholarship and was a graduate research fellowship at the University of Regina in Canada. Jiabo earned a bachelor in petroleum engineering from the China University of Petroleum in Beijing.